Check out Book Talk on YouTube! 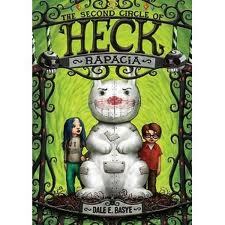 Library-bound Editions of Heck and Rapacia Available at Low Cost! Hardbound Library editions of Heck and Rapacia are about to be liquidated. I have the opportunity to buy these slick, sturdy editions in boxes of 12 for $24 per box. If anyone wants to buy a box for gifts, or to donate to their local school or library, etc. 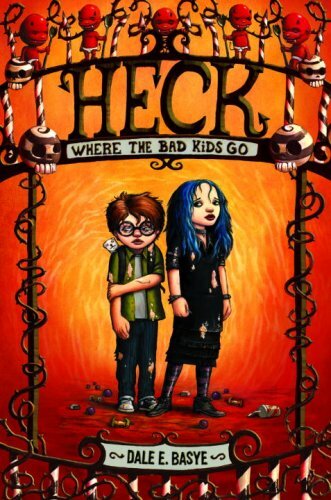 let me know at heck@wherethebadkidsgo.com. I have been looking for a covert way in which to spy on myself. I figure that this way I’ll know if anyone is watching me. Can you give me any advice? Spying on yourself is an excellent way to keep your covert intelligence gathering skills honed in between assignments. This practice, often dubbed “Secret Agent Solitaire,” pits you against yourself — pushing you to new levels of espionage excellence. This method of self-surveillance is not recommended for out-of-work operatives with a predisposition towards schizophrenia, however, as the escalation from mere “stake-out” to “snuff out” can be tragic if the lines of demarcation are blurred. If you do suspect yourself of being a double agent, then an Xcam2 (a small, affordable wireless video camera that transmits video to any TV, VCR or PC in your home, often bundled with a VCR Palm Pack) can help you ascertain your activities during black out periods. Also, acquiring multiple children’s erasable MagnaDoodle writing pads and placing them beneath your carpet before extended periods of self-scrutiny is an affordable way to “retrace your steps” when spying on one’s self. Some agents may find the act of spying on one’s self unsettling. Yet, as you allude, spying on yourself can reveal if anyone is spying on you, other than yourself, that is. 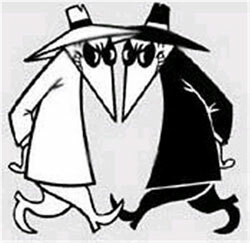 A matter of greater concern would be “who is spying on the person that is not you whom is spying on yourself?” This agent is often the one manipulating the agent you are able to detect and, like measuring the affect of a Black Hole, this agent – if they are worth their weight in high-octane jet fuel – will only be discernible through the actions, or inactions, of their puppet agent. As a footnote, it is my experience (as well as the experience of those actively watching you) that there is no such thing as paranoia: only successive levels of heightened awareness. around as well as I used to. I find most windows and ventilation ducts are inaccessible to wheelchairs. Is there any current legislation requiring government agencies to provide special access to spies under the Americans with Disabilities Act? Dear Mr. B… James B. What an honor it is to hear from you! You are in luck: with so many retired Cold War agents firmly entrenched within the arthritic grip of their winter years, governments (both secret and not-so-secret) are beginning to accommodate these seasoned spies with a host of legislative “mobility” acts, most notably the Geriatric Operatives Undeterred by Disabilities Act (G.O.U.D.A.). Many top secret international facilities are being mandated to construct wheelchair ramps or walker/cane-friendly platforms to access sensitive, high-security areas such as restricted data centers, submarine platforms, satellite/warhead kidnapping installations, cryonic storage repositories, and even super-criminal lairs. For sight-challenged agents, seeing-eye dogs are now allowed in most covert operations centers, and microfilm blueprints are now available either in EZ Read Macrofilm or in a Blueprints-On-Tape format, read by Roger Moore. Also in consideration of geriatric operatives brought out of retirement due to budgetary constraints, conveniently-located bathrooms, clearly-marked signs, oversized keypads and on-site pharmacies (with $25 co-pay) are being offered in most progressive international intelligence facilities and subterranean testing bunkers. An installation in Holland even offers handy curbside service for delivery of sensitive military data. And for those operatives allergic to certain toxic gases or smokescreens, herbal alternatives (like organic mustard gas) are becoming available in most black markets. Posted in Fun Questions from the Author!, Oh Heck! Words from the Author.